Storage is a very convenient option if you are moving to a temporary housing or to a smaller place or renovating your current place. There are probably items you are emotionally attached to, but unfortunately your new house cannot accommodate them. Your grandmother’s old armchair might not be something that you want to throw away even if you don’t have enough room for it. Also, there are items that you might need at some point in the future and you would like to preserve them. Putting your precious items into a storage unit is a efficient way to keep your potentially items safe until you need them at some point. However, they should be properly packed and secured before put into storage. – When thinking about storing your household belongings, first check if there are some items that are not even worth storing and spending additional money. – Get adequate packing supplies – packing paper, padding material, moving blankets, cardboard and specialty moving boxes,… Also, large and bulky items should be dismantled, so make sure you have suitable tools on hand. – Use moving boxes of similar size so that you can stack them and save space. – Each box should be easily accessible at any point. – Mind packing technique and be careful while arranging the items in the storage unit. Heavy items should be packed in smaller boxes in order to be moved easily. Stack light moving boxes on top of the heavy ones. 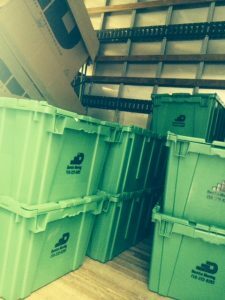 – Overpacked boxes may get damaged or crushed. – Dismantle large items like tables, shelves and beds and keep all tiny parts attached and visible so that you can easily reassemble them. Use specialty mattress covers to protect the mattress against dust, moisture and pests. – Protect delicate furniture pieces with moving blankets and special covers. Plastic wrap may cause increased development of mold and mildew, if applied directly on wooden or leather furniture. – Apply a leather conditioner on leather pieces of furniture and let it dry completely before packing them. – Use original packaging for storing appliances or any other delicate goods. – All stored items should be packed dry and clean so as to keep them free from mold and mildew. – Label each box on all sides so that you can easily identify the one that you are looking for even if they are stacked. – Allow easy access to your items. – Use specialty wardrobe boxes in order to keep your hanging clothes tidy and unwrinkled. Consider using a protective cover for your expensive and high-quality clothes so as to keep it fresh and clean. – Use a lot of cushioning material when packing fragile items like china, antiques, collectibles, glassware,…Purchase specialty boxes for kitchen electronics, flat-screen tv, paintings and mirrors. – Keeping your belongings off the floor on pallets will protect them additionally during cold and wet seasons. – Seal the boxes with a packing tape. – Many storage companies offer suitable storage containers after they have assessed your belongings and decided how many of them you need. Also, they will make sure the containers are delivered and picked up exactly on time. – Discuss if they can provide packing supplies and packing services and how much they charge for it. – Make sure you get any contract or estimate in writing. – Have all your belongings insured while in storage, especially valuable and delicate ones. – Whether you are going to hire professionals or do all the packing yourself depends on your budget. The best would be to ask for an estimate anyway, since the professional service might not be as expensive as you think.